When I was a kid- and that seems like a 100 years ago- I loved dodge ball. I couldn’t get enough of it. It was exhilarating and had the element of danger. We also called it “war”. Most of the guys felt the same way I did, but the gals, on the other hand, really didn’t seem to like it all that much. Part of the draw for me was that element of danger I spoke about. If you were clumsy or made a wrong move, BAM! you might get hit in the side of the head with a ball going 90 mph. OUCH, that really hurt! Over the years I received my share of bloody noses and red marks on the side of my face. Hence, many schools and youth organizations are not so keen on dodge ball any more. Being much older and a little wiser these days, I now have decided that the element of danger is not as alluring as it once was. I like the idea of a kinder gentler dodge ball and have found that Gaga Ball fits that bill. Gaga ball, aka, Octaball, Gorilla Ball, and Israeli Dodge Ball is an outlet for adventure, without the element of danger posed by dodge ball. It is low impact and is played in an octagon enclosure called a gaga pit. My grand kids really love the game so I decided to design a pit that would stand up to the rigors of aggressive play. It is heavy duty and can stand the pressure exerted by constant use. 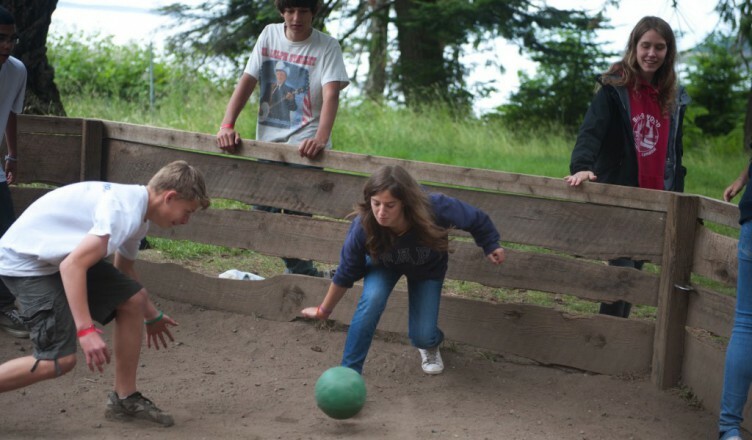 Gaga ball is played by all ages and is enjoyed by boys and girls alike. If you want to learn more about the game click on the Gaga Ball tab and watch the videos. You can also read the “Gaga Ball Rules- How to Play the Game” by clicking on the link to the left. You can also watch the YouTube video’ How to Play Gaga Ball. For more information about the purchase or rental of an OctopitUSA gaga pit give us a call at (248) 752-8165.